For the film, see Simon Magus (film). Simon the Sorcerer, or Simon the Magician (Latin: Simon Magus, Greek Σίμων ὁ μάγος), is a religious figure whose confrontation with Peter is recorded in Acts 8:9–24. The act of simony, or paying for position and influence in the church, is named after Simon. According to Acts, Simon was a Samaritan magus or religious figure of the 1st century AD and a convert to Christianity, baptised by Philip the Evangelist. Simon later clashed with Peter. Accounts of Simon by writers of the second century exist, but are not considered verifiable. Surviving traditions about Simon appear in orthodox texts, such as those of Irenaeus, Justin Martyr, Hippolytus, and Epiphanius, where he is often described as the founder of Gnosticism, which has been accepted by some modern scholars,  while others reject that he was a Gnostic, just designated as one by the Church Fathers. Justin, who was himself a 2nd-century native of Samaria, wrote that nearly all the Samaritans in his time were adherents of a certain Simon of Gitta, a village not far from Flavia Neapolis. According to Josephus, Gitta (also spelled Getta) was settled by the tribe of Dan. Irenaeus held him as being the founder of the sect of the Simonians. Hippolytus quotes from a work he attributes to Simon or his followers the Simonians, Apophasis Megale, or Great Declaration. According to the early church heresiologists, Simon is also supposed to have written several lost treatises, two of which bear the titles The Four Quarters of the World and The Sermons of the Refuter. In apocryphal works including the Acts of Peter, Pseudo-Clementines, and the Epistle of the Apostles, Simon also appears as a formidable sorcerer with the ability to levitate and fly at will. He is sometimes referred to as "the Bad Samaritan" due to his malevolent character. The Apostolic Constitutions also accuses him of "lawlessness" (antinomianism). The earliest reference to Simon is in the canonical Acts of the Apostles; this is his only appearance in the New Testament. But there was a certain man, called Simon, which beforetime in the same city used sorcery, and bewitched the people of Samaria, giving out that himself was some great one: to whom they all gave heed, from the least to the greatest, saying, "This man is the great power [Gr. Dynamis Megale] of God. And to him they had regard, because that of long time he had bewitched them with sorceries. But when they believed Philip preaching the things concerning the kingdom of God, and the name of Jesus Christ, they were baptized, both men and women. Then Simon himself believed also: and when he was baptized, he continued with Philip, and wondered, beholding the miracles and signs which were done. Now when the apostles which were at Jerusalem heard that Samaria had received the word of God, they sent unto them Peter and John: who, when they were come down, prayed for them, that they might receive the Holy Ghost: (for as yet he was fallen upon none of them: only they were baptized in the name of the Lord Jesus.) Then laid they their hands on them, and they received the Holy Ghost. And when Simon saw that through laying on of the apostles' hands the Holy Ghost was given, he offered them money, saying, "Give me also this power, that on whomsoever I lay hands, he may receive the Holy Ghost." But Peter said unto him, "Thy money perish with thee, because thou hast thought that the gift of God may be purchased with money. Thou hast neither part nor lot in this matter: for thy heart is not right in the sight of God. Repent therefore of this thy wickedness, and pray God, if perhaps the thought [Gr. Epinoia] of thine heart may be forgiven thee, for I perceive that thou art in the gall of bitterness, and in the bond of iniquity." Then answered Simon, and said, "Pray ye to the Lord for me, that none of these things which ye have spoken come upon me." Josephus mentions a magician named Atomus (Simon in Latin manuscripts) as being involved with the procurator Felix, King Agrippa II and his sister Drusilla, where Felix has Simon convince Drusilla to marry him instead of the man she was engaged to. Some scholars have considered the two to be identical, although this is not generally accepted, as the Simon of Josephus is a Jew rather than a Samaritan. Justin Martyr (in his Apologies, and in a lost work against heresies, which Irenaeus used as his main source) and Irenaeus (Adversus Haereses) record that after being cast out by the Apostles, Simon Magus came to Rome where, having joined to himself a profligate woman of the name of Helen, he gave out that it was he who appeared among the Jews as the Son, in Samaria as the Father and among other nations as the Holy Spirit. He performed such signs by magic acts during the reign of Claudius that he was regarded as a god and honored with a statue on the island in the Tiber which the two bridges cross, with the inscription Simoni Deo Sancto, "To Simon the Holy God" (First Apology, XXVI). However, in the 16th century, a statue was unearthed on the island in question, inscribed to Semo Sancus, a Sabine deity, leading most scholars to believe that Justin Martyr confused Semoni Sancus with Simon. Justin and Irenaeus are the first to recount the myth of Simon and Helen, which became the center of Simonian doctrine. Epiphanius of Salamis also makes Simon speak in the first person in several places in his Panarion, and the implication is that he is quoting from a version of it, though perhaps not verbatim. In the beginning God had his first thought, his Ennoia, which was female, and that thought was to create the angels. The First Thought then descended into the lower regions and created the angels. But the angels rebelled against her out of jealousy and created the world as her prison, imprisoning her in a female body. Thereafter, she was reincarnated many times, each time being shamed. Her many reincarnations included Helen of Troy, among others, and she finally was reincarnated as Helen, a slave and prostitute in the Phoenician city of Tyre. God then descended in the form of Simon Magus, to rescue his Ennoia, and to confer salvation upon men through knowledge of himself. "And on her account," he says, "did I come down; for this is that which is written in the Gospel 'the lost sheep'. For as the angels were mismanaging the world, owing to their individual lust for rule, he had come to set things straight, and had descended under a changed form, likening himself to the Principalities and Powers through whom he passed, so that among men he appeared as a man, though he was not a man, and was thought to have suffered in Judaea, though he had not suffered. "But in each heaven I changed my form," says he, "in accordance with the form of those who were in each heaven, that I might escape the notice of my angelic powers and come down to the Thought, who is none other than her who is also called Prunikos and Holy Ghost, through whom I created the angels, while the angels created the world and men." But the prophets had delivered their prophecies under the inspiration of the world-creating angels: wherefore those who had their hope in him and in Helen minded them no more, and, as being free, did what they pleased; for men were saved according to his grace, but not according to just works. For works were not just by nature, but only by convention, in accordance with the enactments of the world-creating angels, who by precepts of this kind sought to bring men into slavery. Wherefore he promised that the world should be dissolved, and that those who were his should be freed from the dominion of the world-creators. 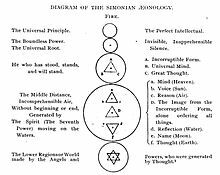 In this account of Simon there is a large portion common to almost all forms of Gnostic myths, together with something special to this form. They have in common the place in the work of creation assigned to the female principle, the conception of the Deity; the ignorance of the rulers of this lower world with regard to the Supreme Power; the descent of the female (Sophia) into the lower regions, and her inability to return. Special to the Simonian tale is the identification of Simon himself with the Supreme, and of his consort Helena with the female principle. But the liar was enamoured of this wench, whose name was Helen, and had bought her and had her to wife, and it was out of respect for his disciples that he invented this fairy-tale. Until he came to Rome also and fell foul of the Apostles. Peter withstood him on many occasions. At last he came [. . .] and began to teach sitting under a plane tree. When he was on the point of being shown up, he said, in order to gain time, that if he were buried alive he would rise again on the third day. So he bade that a tomb should be dug by his disciples and that he should be buried in it. Now they did what they were ordered, but he remained there until now: for he was not the Christ. Hippolytus gives a much more doctrinally detailed account of Simonianism, including a system of divine emanations and interpretations of the Old Testament, with extensive quotations from the Apophasis Megale. Some believe that Hippolytus' account is of a later, more developed form of Simonianism, and that the original doctrines of the group were simpler, close to the account given by Justin Martyr and Irenaeus (this account however is also included in Hippolytus' work). Hippolytus says the free love doctrine was held by them in its purest form, and speaks in language similar to that of Irenaeus about the variety of magic arts practiced by the Simonians, and also of their having images of Simon and Helen under the forms of Zeus and Athena. But he also adds, "if any one, on seeing the images either of Simon or Helen, shall call them by those names, he is cast out, as showing ignorance of the mysteries." Epiphanius writes that there were some Simonians still in existence in his day (c. AD 367), but he speaks of them as almost extinct. Gitta, he says, had sunk from a town into a village. Epiphanius further charges Simon with having tried to wrest the words of St. Paul about the armour of God (Ephesians 6:14–16) into agreement with his own identification of the Ennoia with Athena. He tells us also that he gave barbaric names to the "principalities and powers," and that he was the beginning of the Gnostics. The Law, according to him, was not of God, but of "the sinister power." The same was the case with the prophets, and it was death to believe in the Old Testament. Cyril of Jerusalem (346 AD) in the sixth of his Catechetical Lectures prefaces his history of the Manichaeans by a brief account of earlier heresies: Simon Magus, he says, had given out that he was going to be translated to heaven, and was actually careening through the air in a chariot drawn by demons when Peter and Paul knelt down and prayed, and their prayers brought him to earth a mangled corpse. The apocryphal Acts of Peter gives a more elaborate tale of Simon Magus' death. Simon is performing magic in the Forum, and in order to prove himself to be a god, he levitates up into the air above the Forum. The apostle Peter prays to God to stop his flying, and he stops mid-air and falls into a place called "the Sacra Via" (meaning "Holy Way" in Latin), breaking his legs "in three parts". The previously non-hostile crowd then stones him. Now gravely injured, he had some people carry him on a bed at night from Rome to Ariccia, and was brought from there to Terracina to a person named Castor, who on accusations of sorcery was banished from Rome. The Acts then continue to say that he died "while being sorely cut by two physicians". Another apocryphal document, the Acts of Peter and Paul gives a slightly different version of the above incident, which was shown in the context of a debate in front of the Emperor Nero. 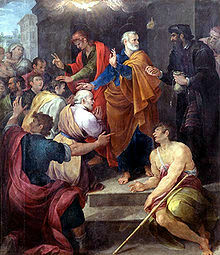 In this version, Paul the Apostle is present along with Peter, Simon levitates from a high wooden tower made upon his request, and dies "divided into four parts" due to the fall. Peter and Paul were then put in prison by Nero while ordering Simon's body be kept carefully for three days (thinking he would rise again). The Pseudo-Clementine Recognitions and Homilies give an account of Simon Magus and some of his teachings in regards to the Simonians. They are of uncertain date and authorship, and seem to have been worked over by several hands in the interest of diverse forms of belief. Simon was a Samaritan, and a native of Gitta. The name of his father was Antonius, that of his mother Rachel. He studied Greek literature in Alexandria, and, having in addition to this great power in magic, became so ambitious that he wished to be considered a highest power, higher even than the God who created the world. And sometimes he "darkly hinted" that he himself was Christ, calling himself the Standing One. Which name he used to indicate that he would stand for ever, and had no cause in him for bodily decay. He did not believe that the God who created the world was the highest, nor that the dead would rise. He denied Jerusalem, and introduced Mount Gerizim in its stead. In place of the Christ of the Christians he proclaimed himself; and the Law he allegorized in accordance with his own preconceptions. He did indeed preach righteousness and judgment to come. There was one John the Baptist, who was the forerunner of Jesus in accordance with the law of parity; and as Jesus had twelve Apostles, bearing the number of the twelve solar months, so had he thirty leading men, making up the monthly tale of the moon. One of these thirty leading men was a woman called Helen, and the first and most esteemed by John was Simon. But on the death of John he was away in Egypt for the practice of magic, and one Dositheus, by spreading a false report of Simon's death, succeeded in installing himself as head of the sect. Simon on coming back thought it better to dissemble, and, pretending friendship for Dositheus, accepted the second place. Soon, however, he began to hint to the thirty that Dositheus was not as well acquainted as he might be with the doctrines of the school. Dositheus, when he perceived that Simon was depreciating him, fearing lest his reputation among men might be obscured (for he himself was supposed to be the Standing One), moved with rage, when they met as usual at the school, seized a rod, and began to beat Simon; but suddenly the rod seemed to pass through his body, as if it had been smoke. On which Dositheus, being astonished, says to him, 'Tell me if thou art the Standing One, that I may adore thee.' And when Simon answered that he was, then Dositheus, perceiving that he himself was not the Standing One, fell down and worshipped him, and gave up his own place as chief to Simon, ordering all the rank of thirty men to obey him; himself taking the inferior place which Simon formerly occupied. Not long after this he died. The encounter between both Dositheus and Simon Magus was the beginnings of the sect of Simonians. The narrative goes on to say that Simon, having fallen in love with Helen, took her about with him, saying that she had come down into the world from the highest heavens, and was his mistress, inasmuch as she was Sophia, the Mother of All. It was for her sake, he said, that the Greeks and Barbarians fought the Trojan War, deluding themselves with an image of truth, for the real being was then present with the First God. By such allegories Simon deceived many, while at the same time he astounded them by his magic. A description is given of how he made a familiar spirit for himself by conjuring the soul out of a boy and keeping his image in his bedroom, and many instances of his feats of magic are given. The Apostles Paul and Peter confront Simon Magus before Nero, as painted by Filippino Lippi. But can any one be educated for teaching by vision? And if you shall say, "It is possible," why did the Teacher remain and converse with waking men for a whole year? And how can we believe you even as to the fact that he appeared to you? And how can he have appeared to you seeing that your sentiments are opposed to his teaching? But if you were seen and taught by him for a single hour, and so became an apostle, then preach his words, expound his meaning, love his apostles, fight not with me who had converse with him. For it is against a solid rock, the foundation-stone of the Church, that you have opposed yourself in opposing me. If you were not an adversary, you would not be slandering me and reviling the preaching that is given through me, in order that, as I heard myself in person from the Lord, when I speak I may not be believed, as though forsooth it were I who was condemned and I who was reprobate. Or, if you call me condemned, you are accusing God who revealed the Christ to me, and are inveighing against Him who called me blessed on the ground of the revelation. But if indeed you truly wish to work along with the truth, learn first from us what we learnt from Him, and when you have become a disciple of truth, become our fellow-workman. The anti-Pauline context of the Pseudo-Clementines is recognised, but the association with Simon Magus is surprising, according to Jozef Verheyden, since they have little in common. However the majority of scholars accept Baur's identification, though others, including Lightfoot, argued extensively that the "Simon Magus" of the Pseudo-Clementines was not meant to stand for Paul. Recently, Berlin pastor Hermann Detering (1995) has made the case that the veiled anti-Pauline stance of the Pseudo-Clementines has historical roots, that the Acts 8 encounter between Simon the magician and Peter is itself based on the conflict between Peter and Paul. Detering's belief has not found general support among scholars, but Robert M. Price argues much the same case in The Amazing Colossal Apostle:The Search for the Historical Paul (2012). There are other features in the portrait which remind us strongly of Marcion. For the first thing which we learn from the Homilies about Simon's opinions is that he denied that God was just. By "God" he meant the creator god. But he undertakes to prove from the Jewish scriptures that there is a higher god, who really possesses the perfections which are falsely ascribed to the lower god. On these grounds Peter complains that, when he was setting out for the gentiles to convert them from their worship of many gods upon earth, Satan had sent Simon before him to make them believe that there were many gods in heaven. In Irish legend Simon Magus came to be associated with Druidism. He is said to have come to the aid of the Druid Mog Ruith. The fierce denunciation of Christianity by Irish Druids appears to have resulted in Simon Magus being associated with Druidism. The word Druid was sometimes translated into Latin as magus, and Simon Magus was also known in Ireland as "Simon the Druid". The church of Santa Francesca Romana, Rome, is claimed to have been built on the spot where Simon fell. Within the Church is a dented slab of marble that purports to bear the imprints of the knees of Peter and Paul during their prayer. The fantastic stories of Simon the Sorcerer persisted into the later Middle Ages, becoming a possible inspiration for the Faustbuch and Goethe's Faust. The opening story in Danilo Kiš's 1983 collection The Encyclopedia of the Dead, "Simon Magus", retells the confrontation between Simon and Peter agreeing with the account in the Acts of Peter, and provides an additional alternative ending in which Simon asks to be buried alive in order to be resurrected three days later (after which his body is found putrefied). ^ "Simon Magus | Samarian magician". Encyclopedia Britannica. Retrieved 2017-02-23. ^ "CHURCH FATHERS: Against Heresies, I.23 (St. Irenaeus)". www.newadvent.org. ^ Caesarea), Eusebius (of Caesarea, Bishop of (5 May 1894). "The Ecclesiastical History of Eusebius Pamphilus, Bishop of Caesarea, in Palestine". George Bell & Sons – via Google Books. ^ Hippolytus: Refutation of All Heresies can be found in Rev. Alexander Roberts and James Donaldson, eds., The Ante-Nicene Fathers (1919; reprint ed., Grand Rapids, MI: Eerdmans, 1971), 5:74–81, for the part we need about Simon. ^ Ferreiro, Alberto (5 May 2018). "Simon Magus in Patristic, Medieval And Early Modern Traditions". BRILL – via Google Books. ^ Rudolph 1977, pp. 312 ff. ^ Haar 2003, p. 306. ^ Flavius Josephus "The Works of Flavius Josephus" London: R. Penny (1733) Page 1008 Index: "Gitta see Getta"
^ John Gill "An Exposition of the Whole Old Testament" London: George Keith (1780) Vol. 3, page 134: "This is the inheritance of the tribe of the children of Dan. Before described by its cities, which were in it. This tribe was bounded by Ephraim on the north, by Judah on the east, by Simeon on the south, and by the Mediterranean sea on the west. Josephus (h) says, the Danites enjoyed the vale which lies to the setting sun, bounded by Azotus and Doris, and all Jamnia and Getta, from Accaron (or Ekron) to the mountain from whence the tribe of Judah begins." ^ Flavius Josephus "The Famous and Memorable Workes of Iosephvs" G.Bishop, S.Waterson, P. Short and Tho. Adams. (1602) - Page 106: "To them of Dan was assigned the valley that is extended to the Westward, and is terminated by the Cities of Azoth and Dor, that containeth all the countrey of Iamnia and Gitta, from Akaron even unto that mountaine where beginneth the tribe of Iuda." ^ "CATHOLIC ENCYCLOPEDIA: Simon Magus". www.newadvent.org. ^ "CATHOLIC ENCYCLOPEDIA: St. Justin Martyr". www.newadvent.org. ^ Dictionary of Christian Biography, Vol. 4, p. 682. ^ Hastings' Dictionary of the Apostolic Church, Vol. 2, p. 496. ^ Constitutions of the Holy Apostles, vi. § 4, 16. ^ "Geburah, or Dynamis, was an appellative or metonym of "The Divine Glory" among the apocalypticists, and with this very meaning entered the Gospels in the famous passage: 'You shall see the Son of Man seated at the right hand of the Dynamis [Matthew 26:64; Mark 14:62].' Although in rabbinic sources of the first and second centuries the name Dynamis was widely used as a synonym for God Himself, the esoteric use continued in the circles of the Merkabah mystics. ... This term must have had wide usage, since according to the Acts of the Apostles 8:10 even the Samaritan Simon Magus claimed to be the Great Dynamis: ἡ δύναμις τοῦ θεοῦ ἡ καλουμένη μεγάλη." Scholem, p. 67. ^ "LÜDEMANN (1989: 96-98) has raised the question whether, on the basis of Luke's own knowledge of the tradition, Luke had made some ironic allusion to Helen as Simon's ἐπίνοια in his reference to the state of Simon's heart: ἡ ἐπίνοια τῆς καρδίας (8:22). If so, as LÜDEMANN argued, the two essential elements of Gnostic Simonian religion are already found in Acts: 'the god Simon and his syzygos, ἐπίνοια.'" Haar 2003, p. 82. ^ Josephus, Antiquities of the Jews, 20:7, §2. ^ Hilgenfeld, Ketzergeschichte, p. 170; Albert, Die Ersten Fünfzehn Jahre der Christlichen Kirche, p. 114, Münster, 1900; Waitz, in Zeitschrift für Neutestamentliche Wissenschaft, v. 128; Price 2012. One or more of the preceding sentences incorporates text from a publication now in the public domain: Chisholm, Hugh, ed. (1911). "Simon Magus" . Encyclopædia Britannica. 25 (11th ed.). Cambridge University Press. pp. 126–130. ^ Semoni Sanco Deo. Gruter, vol. 1, p. 95, n. 5. ^ Matthew 18:12; Epiphanius, Panarion, 21.3.5. Williams, vol. 1, p. 60. ^ Epiphanius, Panarion, 21.2.4. Williams, vol. 1, p. 58. One or more of the preceding sentences incorporates text from a publication now in the public domain: Salmon, George (1911). "Simon Magus" . In Wace, Henry; Piercy, William C. Dictionary of Christian Biography and Literature to the End of the Sixth Century (3rd ed.). London: John Murray. ^ Hippolytus, Refutation of all Heresies, 6, 19. ^ Hippolytus, Refutation of all Heresies, 6, 15. ^ Cyril of Jerusalem, Catechetical Lectures, vi. 15. ^ "The Acts of Peter". www.earlychristianwritings.com. ^ Acts of the Holy Apostles Peter and Paul. ^ Clementine Homilies, ii. 23. ^ Clementine Recognitions, ii. 11. ^ Cf. Plotinus, Ennead II, 9, 10: "They first maintain that the Soul and a certain 'Wisdom' [Sophia] declined and entered this lower sphere . . . Yet in the same breath, that very Soul which was the occasion of descent to the others is declared not to have descended. 'It knew no decline,' but merely illuminated the darkness in such a way that an image of it was formed upon the Matter. Then, they shape an image of that image somewhere below — through the medium of Matter or of Materiality . . . and so they bring into being what they call the Creator or Demiurge, then this lower is severed from his Mother [Sophia] and becomes the author of the Cosmos down to the latest of the succession of images constituting it." MacKenna trans., p. 230. ^ As the Peregrinations of Peter. Epiphanius, Panarion, 30.15.1. Williams, vol. 1, p. 131. ^ Clementine Homilies, xvii. 5; 14. ^ "The decision [in the Pseudo-Clementines] to associate Paul with Simon Magus is surprising since they have little in common. It is generally accepted that this association represents a later stage in the development of Ps.-Clem. and was an attempt to do away with or adapt some of the criticisms that had been aimed at Paul." Verheyden, p. 333. ^ "Baur's view that Simon is Paul has occasionally been questioned . . ." Bockmuehl, p. 102. ^ ". . . letters (beginning of the second century AD, which give no evidence of strife between Peter and Paul) were spurious and late. . . . The idea of a revival of Baur's thesis appears to be quite self-conscious and explicit:" Pate, p. 439. ^ Clementine Homilies, ii. 14. ^ Clementine Homilies, iii. 10; 38. ^ E.g. Clementine Homilies, iii. 3; 9; 59. ^ Spence, Lewis (1999). The Magic Arts in Celtic Britain. p. 36. ISBN 9780486404479. ^ Sometimes with Mug Ruith. MacKillop, p. 337. ^ "Surely few admirers of Marlowe's and Goethe's plays have an inkling that their hero is the descendant of a gnostic sectary, and that the beautiful Helen called up by his art was once the fallen Thought of God through whose raising mankind was to be saved." Jonas, p. 111. ^ Power, Chris (2 August 2012). "A brief survey of the short story part 42: Danilo Kiš". The Guardian. Retrieved 16 December 2013. ^ Taylor, Benjamin (1995). Into the Open: Reflections on Genius and Modernity. NYU Press. pp. 107 n.1. ISBN 9780814782132. Gruter, Janus (1707). Inscriptiones antiquae totius orbis romani, in absolutissimum corpus redactae. Amsterdam: Franciscus Halma. Mead, G.R.S. (1892). Simon Magus. London: Theosophical Publishing Society. Legge, Francis (1964) . Forerunners and Rivals of Christianity, From 330 B.C. to 330 A.D. (Two volumes bound as one ed.). New York: University Books. LCCN 64-24125. Plotinus (1921). Psychic and Physical Treatises: Comprising the Second and Third Enneads. Volume 2. Stephen MacKenna. London: P.L. Warner, publisher to the Medici Society. Jonas, Hans (2001) . The Gnostic Religion (3rd ed.). Boston: Beacon Press. ISBN 0-8070-5801-7. Scholem, Gershom (1965). Jewish Gnosticism, Merkabah Mysticism, and Talmudic Tradition. Jewish Theological Seminary of America. Rudolph, Kurt (1977), Die Gnosis: Wesen u. Geschichte e. spätantiken Religion, Leipzig: Koehler & Amelang . Williams, Frank (1987). The Panarion of Epiphanius of Salamis. 2 volumes. Leiden; New York; København; Köln: E.J. Brill. ISBN 978-90-04-07926-7. Lüdemann, Gerd (1989). Early Christianity according to the Traditions in Acts: A Commentary. Minneapolis: Fortress Press. MacKillop, James (2004) . A Dictionary of Celtic Mythology. New York: Oxford University Press. ISBN 978-0-19-860967-4. Pate, C. Marvin (2000). The Reverse of the Curse: Paul, Wisdom, and the Law. Haar, Stephen Charles (2003), Simon Magus: The First Gnostic?, Walter de Gruyter, ISBN 978-3-11-017689-6 . Verheyden, Jozef (2004), "Demonization of the Opponent", in Hettema, Theo L.; van der Kooij, Arie, Religious Polemics in Context . Cartlidge, David R. (Fall 2005). "The Fall and Rise of Simon Magus". Bible Review. 21 (No. 4): 24–36. Bockmuehl, Markus (2010). The Remembered Peter: In Ancient Reception and Modern Debate. Mohr Siebeck.